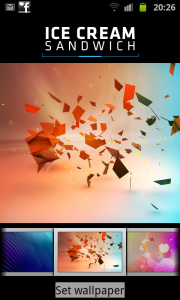 Get Ice Cream Sandwich Theme on Android Phones with ICS Wallpapers. New graphics for action bar! This theme would completely replicate all the icons of the Android 4.0 system and also give you a real experience on how the new OS would be. 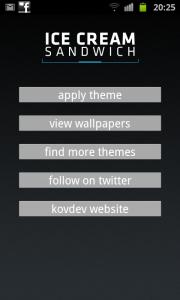 You need an Launcher or ADW Theme to run the application following which you need to tap on the ‘Apply Theme’ option to enable it. 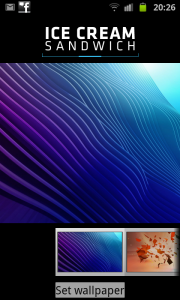 You can also tap on the ‘View Wallpapers’ option to check out the other walls which come preloaded with this.